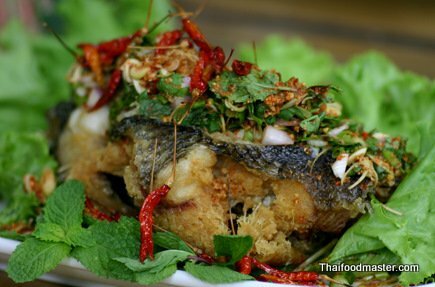 Laap is a top dish on menus in Thai restaurants abroad. Unfortunately, much like the décor found in many of those restaurants, laap has been diminished by oversimplified descriptions, by bland seasonings, and even by the incorrect English transcription, as “larp”. Laap (ลาบ) is believed to originate from Yunnan province in Southwest China, and is popular in Laos and the northern (Lanna) and northeastern (Isan) regions of Thailand. Its ingredients and preparation, as well as the spices and herb combinations, vary greatly from region to region and from city to city, and also depend on the type of meat used in the dish. Generally speaking, laap is made from minced meat, raw or cooked, to which – depending on the type of laap and the region in which it is being created – different ingredients and seasonings are added. 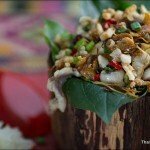 Animal fats, skin, internal organs, blood, bile juice, and gastric juices – along with simple or complex flavorings that can comprise up to twenty kinds of spices and more than thirty types of herbs in various combinations – make up a wide range of principal dishes – namely: laap (ลาบ), saa (ส้า), luu (หลู้), koi (gaawy, ก้อย), sohk-lek (ซกเล็ก), leuuat bplaaeng (เลือดแปลง), dtap waan (ตับหวาน), and the popular nam dtohk (น้ำตก). Laap is prepared much like a salad, by mixing together all the ingredients, including minced meat, internal organs, other meat cuts, spice blends, seasonings and herbs. It is served accompanied by a diverse assortment of vegetables, young leaves and herbs. There are two main styles of laap – laap from Lanna, and laap from Isan. The Lanna version, known as laap muang (ลาบเมือง), features a rich blend of dry spices, resulting in a mildly spicy, pungent, salty and aromatic dish. 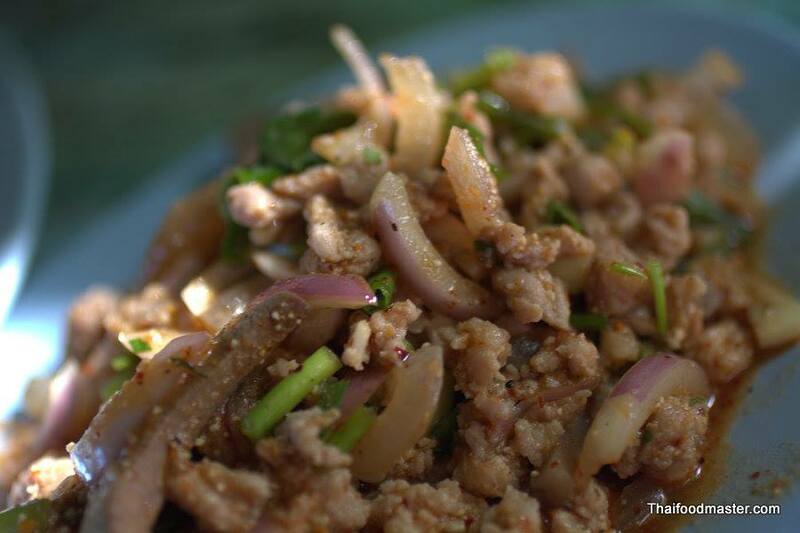 Neither lime juice or ground roasted rice is used in laap muang. The seasoning blend for laap muang is called naam phrik laap (น้ำพริกลาบ), and contains sought-after spices that were originally imported to the region by trade caravans from India and China. Laap Isan (ลาบอีสาน), on the other hand, is spicy, salty and a bit sour, with notes of nuttiness from the inclusion of ground roasted rice. Laap Isan is seasoned with a simple blend of just a few ingredients: ground chili powder, lime juice, fish sauce, and ground roasted rice that also serves as a binder. The dish is then finished up with fresh herbs – spring onions, coriander and mint leaves. Far off the ancient spice trade routes, Isan food does not utilize aromatic dry spices. In both Lanna and Isan, fresh blood, bile juice and gastric juices are often added to raw laap of beef or buffalo, with the bitterness of these additions magically enhancing the intrinsic sweetness of the raw meat. All laap dishes, regardless of their regional origin or meat type, are lifted with fresh herbs – coriander, spring onions, and mint leaves, among others – that add freshness and fragrance to the dish. To complement the soft texture of the minced meat, just before serving the dish is sprinkled with crunchy elements- fried crispy chilies, deep-fried crispy shallots and garlic, pieces of fried internal organs and crispy skins, or even deep-fried crispy fish scales. Laap is one of those dishes in Asian popular cuisine where the food is more than just a meal, but an integral part of one’s culture; expressing a distinct relationship between humans, nature and society – a relationship that should be treasured because it is the one around which each dish was originally created – a feast believed to facilitate good health and bring good luck, an enjoyable time spent among friends, neighbors and relatives. 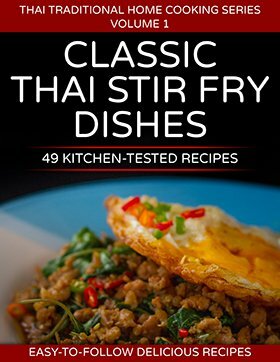 The word ‘laap’ in the Northern Thai language literally means the action of mincing meat. The same pronunciation with a different spelling is used for a word that denotes unexpected gains, profits and good luck (ลาภ). And, related to the history that shaped laap as we know it, is that large animals, such as cows or buffalos, were treasured; raised to work the rice paddies, and not for their meat. Most people’s daily diet consisted mainly of fruits and vegetables, fish, chicken, pork, or small animals gathered in the forest – buffalo and beef meat were scarce and expensive, and therefore were eaten only on special occasions. As well, laap is a complicated dish to prepare, incorporating many stages and ingredients. It is a time- and labor-intensive process, with friends and relatives coming together to participate and lend a helping hand. Producing laap established an important thread in the social fabric, becoming a central event in the village’s social activity. The tedious process of making laap, the social activity associated around it, and the high price of its ingredients, gave it an added value – making it a dish suitable for and served in ceremonies and celebrations, or offered to important guests. While markets and kitchens used to be female-only domains, laap was probably the only dish a man would ever cook, and most likely not even eaten by women – at least not the raw meat version. Raw laap is a dish full of testosterone: it is a manly brotherhood of butchering the animal, and boldly eating it uncooked with some friends – and a lot of alcohol. Roadside restaurants that specialize in laap, blood dishes, and alcoholic remedies for men are called laap luu lao (ลาบ หลู้ เหล้า). These eateries are part of a still-vivid macho subculture that is very much alive at the grass roots of Northern Thailand and Isan culture. “Bitter to death, I will not protest” is the popular expression to describe a scrumptious bitter, raw laap (khohm dtaai baaw ao reuuang, ขมตายบ่เอาเรื่อง ). Laap and alcohol are closely paired; both are strong enough to stand up to each other and act as complements. Alcohol is believed to sterilize the raw meat from any parasites, while the bitterness of both the laap and the accompanying vegetables facilitates smooth drinking –together regarded as a strong folk medicine believed to improve men’s vitality and strength. In addition to its alleged potency enhancing properties, laap is nutritionally rich. It is a well-balanced dish loaded with proteins, flavored with spice mixtures that offer potent medicinal properties, and accompanied by a variety of greens and vegetables carefully selected for their taste, scent or therapeutic properties. Laap is a dish popular among the Tai Yuan (คนยวน) and the Tai Lu (ไทลื้อ) – two closely related Tai ethnic groups with linguistic, historic and cultural ties. The Tai Yuan (Khun Muang) make up the majority of the population inhabiting the valleys and plains of present-day Northern Thailand and the former Lanna kingdom. They lived in self-sustained villages of rice growers; their economy was based mainly on production for household use. Their traditions shared an intimate relationship with the natural world, mixed with Buddhist beliefs. They centered their everyday life activities around community, ceremony, and rituals. The Tai Lu, who lived north of the Lanna kingdom as far as Sipsong Panna in Yunnan, along with the Burmese Shan and those in Luang Prabang (Laos), shared a culture very similar to the Tai Yuan, with variations only in details. The fertile lands of Northern Thailand attracted human migration from South and East Asia for thousands of years. The Tai Lu population migrated from the Shangri-La of Sipsong Panna in Yunnan province, along the plains of major rivers, and developed close ties with the villages in Northern Thailand through trade, politics, and religion. Furthermore, because of cultural similarities among the Tai Yuan and Tai Lu, when Lanna was short of manpower, the king would endeavor to forcibly relocate Tai Lu families to Lanna. The resettlements encompassed people of all social levels, from nobles to commoners. Resettled nobles were permitted to continue to govern their own people under the supervision of Lanna leaders and to keep their old cultural system. Even today, a few hundred years later, laap is a dish that is eaten by commoners and nobles alike. Internal trade among nearby villages was limited and took place at occasional markets. People produced their own products – such as vegetables, fruits, chicken, fish, and pork – to exchange for externally produced goods like clothing, kitchen utensils and matches from Chinese and Burmese traders. 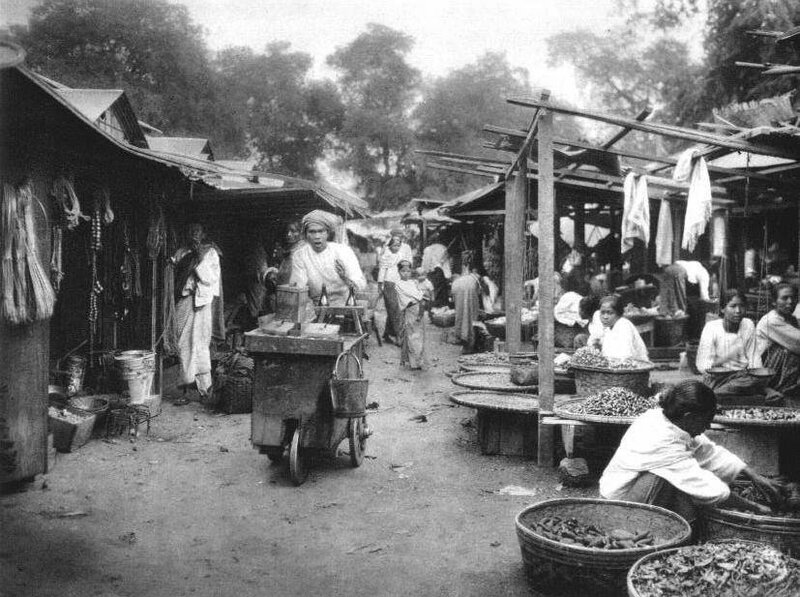 At the local market, both traders and customers were female, with the exception of the male pork sellers, the Burmese kitchenware merchants, or a male occasionally visiting the market in search of meat, spices, and herbs to prepare laap. It was mainly Chinese traders who conducted the long-distance caravan trade between Yunnan, Lanna, and Burma, carrying not only fermented tea and opium, spices and musk, wax and honey, betel and chilies, wool, cotton and silk, or brass kitchen utensils, but also culture – linking people, traditions and ideas along the fragrant and somewhat romantic spice trade routes. Naam phrik laap is at the heart and soul of laap muang (Lanna-style laap) – it is the chili paste used as its main flavoring agent. 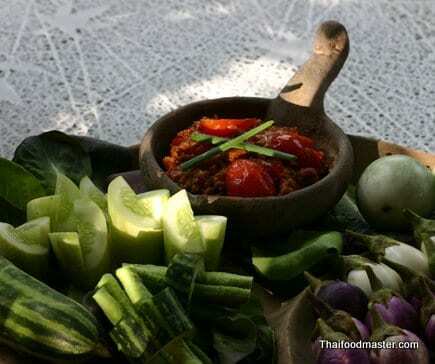 Referred to as the “black chili paste” (nam phrik dam, น้ำพริกดำ) due to its dark color, its quality is measured by the delicacy with which its ingredients are balanced; it is essential to a successful laap muang. The flavor profile of naam phrik laap is fiery-spicy and salty, with a pungent perfume. In Northern Thai cuisine, naam phrik laap is used as a flavoring agent for a range of dishes other than laap. Since laap is a salad-like dish where the ingredients are all mixed together, these similar dishes’ names include the prefix ‘salad’ (yam, ยำ), even though they might be a soup or a curry-like dish. 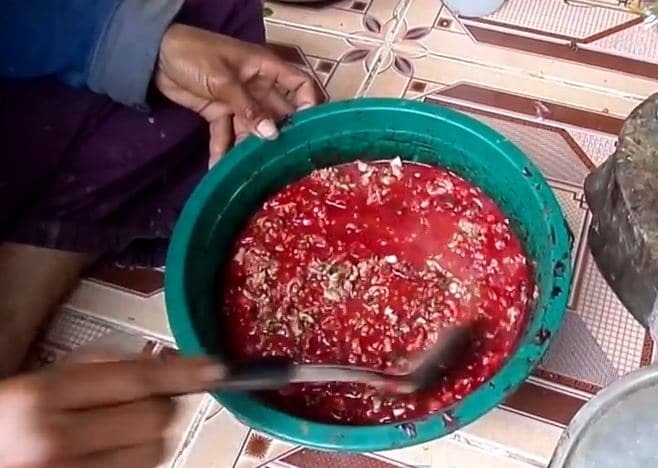 In the early days, when laap was prepared in the village, the responsibility for producing the perfectly balanced naam phrik laap for the occasion was borne by skilled, talented individuals with years of experience. These days, naam phrik laap is commercially available and sold in markets ready-made and pre-packed in small quantities under various brand names, and with different spice combinations and flavor intensities. The advent of easily accessible naam phrik laap made it possible for the average household to prepare and eat laap as an everyday dish. In general, the more pungent preparations are selected for laap made using beef or buffalo meat, due to the gamey taste, while the milder brands are reserved for laap made of pork, chicken or duck, or used in other dishes as a flavoring agent. There are many recipes for naam phrik laap, all of which call for meticulous individual preparation of each ingredient, including roasting, sun drying or even sometimes pickling, before pounding them together into a smooth paste to which roasted shrimp paste and salt are added. The paste is dried, roasted or fried, with just a little bit of oil, to ensure that all the flavors have melted into a completed product, and that the paste water content is as low as possible to guarantee a long shelf life. Dry chili peppers are charred and roasted to a dark, almost burnt color. Garlic, lemongrass, and coriander roots are roasted until fragrant. Mature galangal and mature ginger are sun-dried for few hours before being roasted. Shallots are roasted, pickled, boiled or used fresh. Fermented shrimp paste is being roasted in banana leaves (for both aroma and food safety). Dry spices are roasted on low heat to release their aroma. Coriander seeds (ลูกผักชี), makhwaen (zanthoxylum limon-ella alston, มะแขว่น) and deebplee (Javanese long pepper, ดีปลี) in almost equal quantities, account for about 80 percent of the spice mix. The rest comprises small quantities of cumin seeds (ยี่หร่า), sweet fennel (เทียนข้าวเปลือก), black peppercorns (พริกไทยดำ), nutmeg (ลูกจันทน์เทศ), mace (ดอกจันทน์เทศ), cinnamon (อบเชย), star anise (โป๊ยกั๊ก), cloves (กานพลู), sand ginger (เปราะหอม), dill seeds (มะแหลบ or เทียนตั๊กแตน) and cardamom (ลูกกระวาน). Makhwaen, a relative of Szechuan pepper, and deebplee (long Indian pepper) are probably the most important spices in naam phrik laap. They give it a unique, pungent heat spiciness – and an unmistakable aroma that accompanies a mild sensation of numbness on the lips. 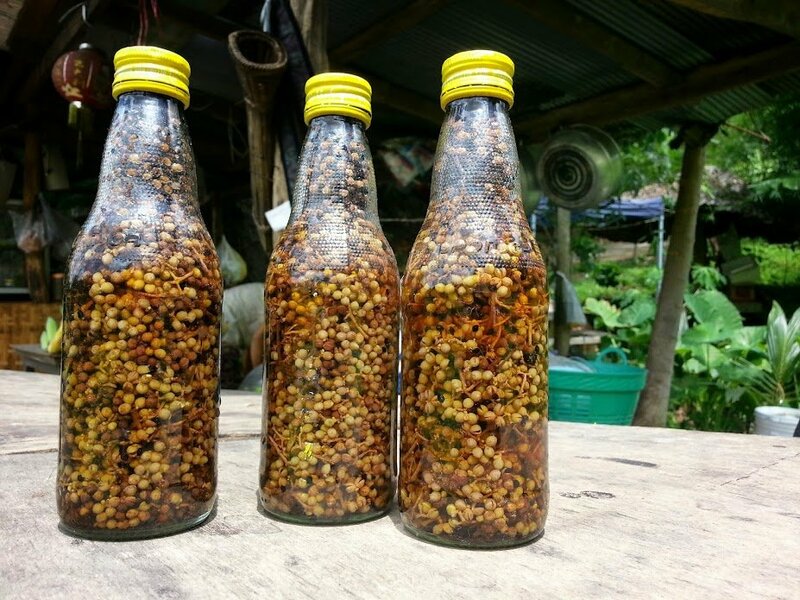 The provinces of Phrae (แพร่) and Nan (น่าน) are famous for their copious use of makhwaen and deebplee, resulting in what is considered the most pungent naam phrik laap available. In the northeastern parts of Lanna, mainly in the provinces of Lampoon and Chiang Mai, it is common to find naam phrik laap perfumed with Chinese five-spice mix (cinnamon, star anise, cloves, peppercorns and fennel seeds). Up in the northern provinces of Phayao and Chiang Rai, a distinct naam phrik laap is produced with the addition of pickled shallots and pickled bird’s eye chilies, a practice similar to the use of the pickled mustard leaves so beloved by the Yunnanese. Making laap is largely about mincing the meat to the right consistency. An art in itself, mincing the meat should be accomplished with a knife, a cutting board and plain muscle force. 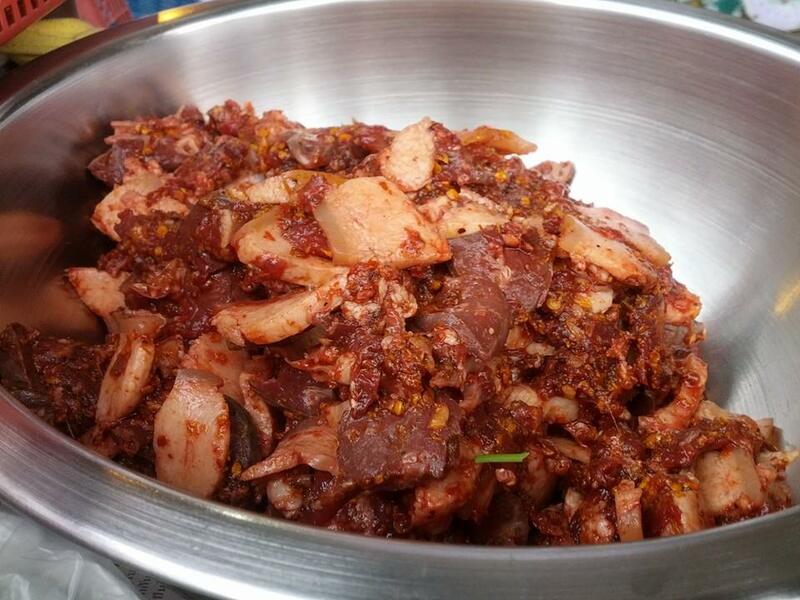 The mincing is completed gradually, by pounding the meat with the knife. The experienced cook will add, from time to time, small amounts of fresh blood to adjust the consistency – which should be smooth and somewhat gummy, and should hold together. The preferred meat cuts for good laap are the sirloin or the round. 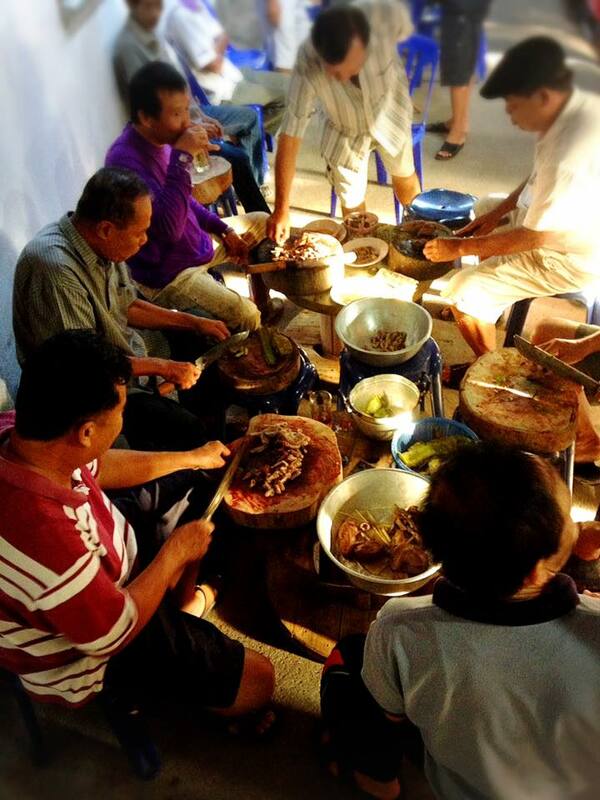 Consider the enormous effort required to manually prepare large amounts of meat for a community ceremony: the men gathered, sitting in a circle, with each man wielding two knives for pounding meat, with the rhythmic beat of the knives acting as an invitation for neighbors to join the activities. The skin and internal organs, apart from the lungs, are thoroughly cleaned, and boiled in water with a few stalks of lemon grass until soft and tender; then they are sliced into bite-size pieces. To add some crunch to the dish, some of the fat, skin and internal organs, along with garlic and shallots, are deep-fried separately until golden and crisp. In Thai, the act of mixing all ingredients together in a salad-like fashion is called yam laap (ยำลาบ) or so laap (โสะลาบ): The minced meat is mixed with the naam phrik laap, to which a small amount of the collagen-rich stock (from boiling the internal organs) is added as necessary to achieve the right consistency – not too watery and not too dry. Then the internal organs are added along with chopped aromatic herbs, and the dish is finished by topping it with the crispy fried goodies. Bile juice (nam dee, น้ำดี) and gastric juice (naam phiia, น้ำเพี้ย) are added sometimes as bitter seasonings for beef or buffalo laap. 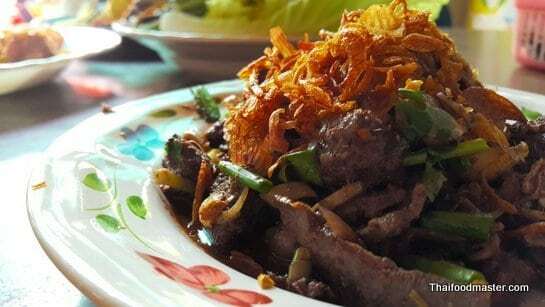 Finally, to make a cooked laap, the ready-to-eat and fully seasoned laap, already mixed with herbs, is roasted in a wok without the addition of oil or liquids to cook the meat: this result is referred to as laap khuaa (ลาบคั่ว) in Lanna, or laap sook (ลาบสุก) in Isan. 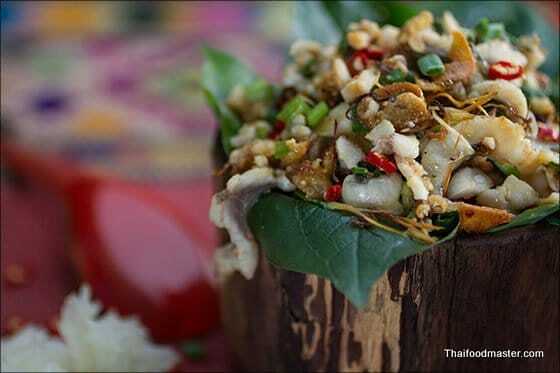 Laap served with a wide range of herbs, vegetables and green leaves is known as phak gap laap. 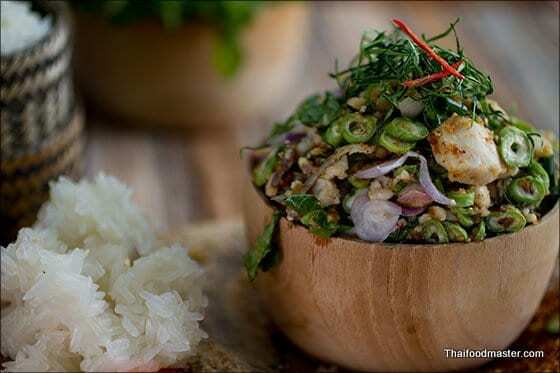 Phak gap laap (ผักกับลาบ) is the term used to describe the different herbs, vegetables, and young leaves – usually between twenty and forty – that are served with the laap, many of which can be found near the home or in the fields and forests. This selection was shaped by geographical region and seasonal changes, as well as according to each element’s medicinal properties, flavor, or aroma; the selection also based on ancient wisdom and cooking techniques that had been passed down through generations. Phak gap laap is compiled from three main groups – aromatic herbs, sour leaves, and bitter herbs. Each has its own role in the dish: The aromatics add a pleasant fragrance to counter the gamey taste of raw meat and blood; the sours complement the taste of laap, and aid in the digestion of the uncooked meat; and the bitter herbs are believed to cure a wide range of ailments. It is feasible to imagine that the duty of collecting such a wide range of vegetables and greens was the responsibility of the women or the children of the village, while the men chopped the meat and drank alcohol. Cucumbers, tomatoes, cabbage, cauliflower, bird’s eye chilies, winged beans, yardlong beans and mustard greens; an assortment of eggplants – apple eggplants, yellow bitter eggplants or pea eggplants; aromatic herbs such as rose petals, spring onions, coriander, sawtooth coriander, Vietnamese coriander, mint and fennel. Laap muang is a generic name that covers all laap dishes from the northern parts of Thailand where dry spices are added. It is used to distinguish the northern version of laap from the northeastern, or Isan style, of laap. 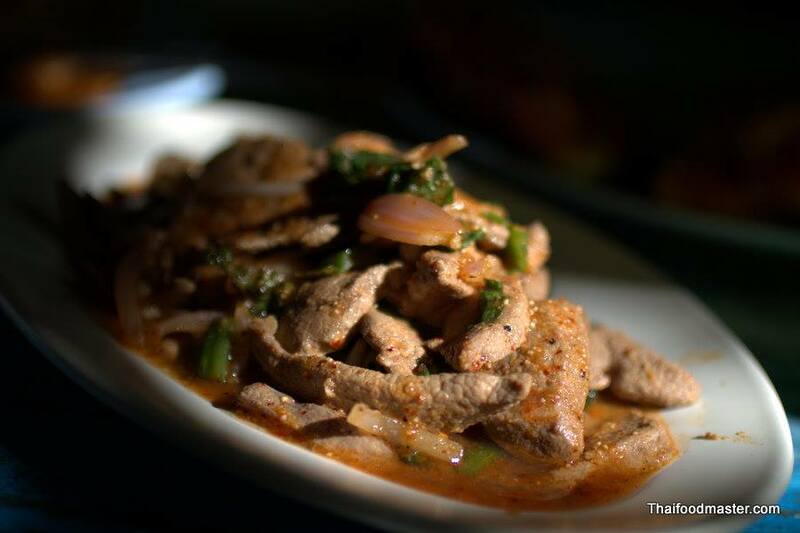 Saa (ส้า) – used in the North to describe a laap-like dish were the meat is sliced thinly rather than minced. Laap Dip (ลาบดิบ) – laap made from raw meat. Laap Dee Khohm (ลาบดีขม) – a bitter laap recipe to which bile juice and gastric juice have been added. Laap Khuaa (ลาบคั่ว) – laap that has been seasoned first, and then roasted in a wok or pan to cook the meat. There are two versions of laap khuaa – dry and wet. Laap Khuaa Haaeng (ลาบคั่วแห้ง) – roasted dry laap. The laap mixture has been pre-seasoned, and then roasted in a wok or pan without adding any fluids. Blood is rarely added to this recipe as the roasting causes it to turn black, rendering the final dish less appealing. Laap Khuaa Naam (ลาบคั่วน้ำ) – roasted wet laap. Laap with a thick sauce made by cooking the pre-seasoned laap with small amounts of stock left over from boiling the internal organs and blood. Laap Niaao (ลาบเหนียว) is a viscous laap, gooey in texture. In some regions, this is also called laap niian (ลาบเนียน) or laap naam dtohn (ลาบน้ำโตน). Laap niaao is a wet, raw version of laap to which the thick and collagen-rich stock left after boiling the internal organs and blood is added for texture. Laap Mee (ลาบหมี่) – a version of laap using only the internal organs, mixed together with large quantities of fried crispy garlic. Laap Law (ลาบลอ) – a laap that uses equal amounts of beef and buffalo meat mixed together. Laap Khamooy (ลาบขโมย) – thieves’ laap. A laap in which the meat is not finely minced, as if the cook was on the run and in a rush to finish it up. The name was probably invented to describe laap that was made from stolen pieces of beef, where the thieves were in a hurry to prepare and finish it before being discovered. Laap Gao (ลาบเก๊า), Laap Glai Jaaeng (ลาบใกล้แจ้ง) and Saa Deuk (ส้าดึก) – the names given to the first plates of laap or saa served at an important ceremony as a breakfast. Laap preparations usually started off late the night before with the animal butchering; by the time the guests arrived – hungry and tired – not all the ingredients were necessarily prepared. Thus, this laap consists of what was ready when guests arrived. It can also refer to laap that was made immediately after the animal was killed, in small amounts, when the meat was still warm and fresh. 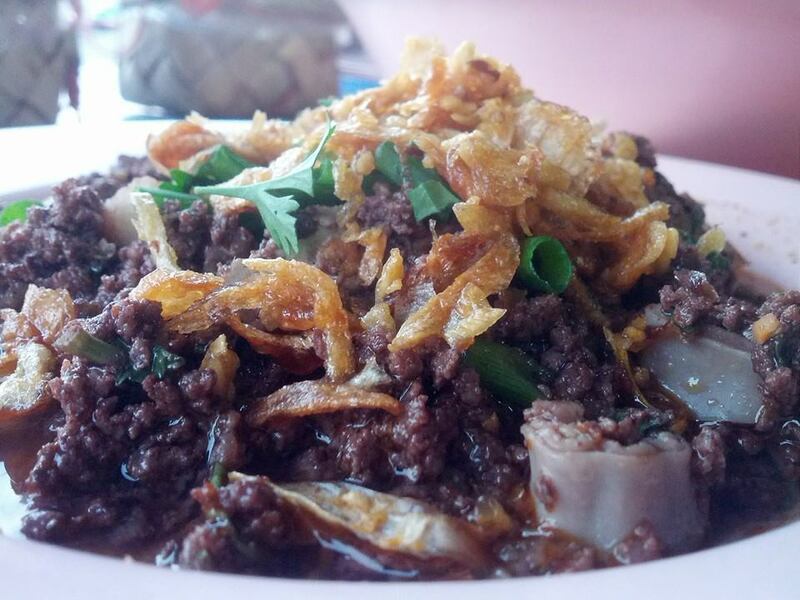 Luu (หลู้ หรือ ลู่) – a dish made from minced buffalo meat or beef, to which blood is added to fill the plate. The blood is prepared by first working it well with crushed lemongrass and kaffir lime leaves, to counter the gamey flavor. Luu is seasoned with naam phrik laap and pickled garlic; crispy fried kaffir lime leaves, fried garlic, and fried internal organs are sprinkled on top. Luu Phiia (หลู้เพี้ย) – same as luu, but the meat is covered with gastric juices instead of blood. Sohk Lek (ซกเล็ก) – the Isan version of luu, which is much spicier than the Lanna version. Leuuat Bplaaeng (เลือดแปลง) – this dish is popular among people of Vietnamese descent in Northern Isan. This is a laap made with the internal organs of a cooked pig, and served with fresh pork blood. Laap Isan, popular across the country and abroad, is a relatively easy dish to prepare: and this is the dish that most often comes to mind when laap is mentioned. 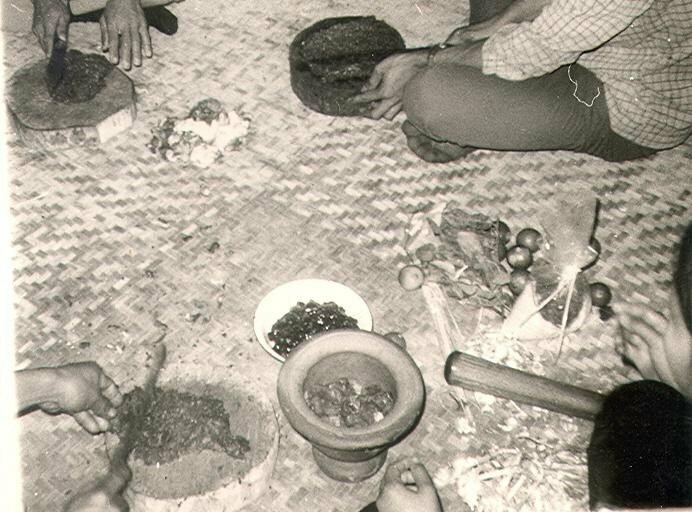 The people of Isan create laap-like dishes from almost any animal protein they can obtain – beef, buffalo, pork, chicken and duck, birds, fish and shrimp, red ant’s eggs, lizards, and so on. Seasoning is simple and straightforward, including ground chili powder, ground roasted rice, lime juice, and fish sauce or fermented fish sauce. Once seasoned, the laap is mixed with spring onions, coriander leaves, and mint leaves. 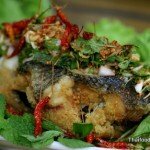 Laap Isan is fresh, spicy, salty and a bit sour, with notes of nuttiness from the ground roasted rice. 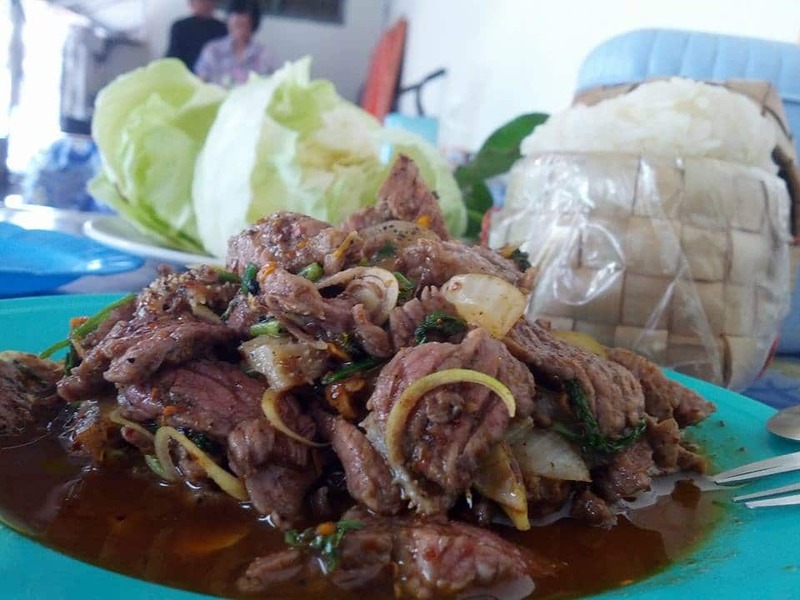 Koy (ก้อย gaawy) – a laap-like dish where the meat is thinly sliced rather than minced. Gaawy Neuua (ก้อยเนื้อ) and Laap Dip (ลาบดิบ) – both refer to the same Isan-style laap, made from raw minced meat. Laap Leuuat (ลาบเลือด) – Similar to luu in Lanna and sohk lek in Northern Isan. It is a laap made of minced buffalo meat or beef to which blood is added to fill the plate. Nam Dtohk (น้ำตก) – this dish is made from barbecued pork, usually the neck, which is sliced to bite-size pieces. The meat is then brought to a boil with some stock, to create some sauce. The heat is turned off and then sliced shallots, ground roasted rice, chili powder, lime juice, and fish sauce are added, along with shredded coriander leaves, spring onions, and mint leaves. Dtap Waan (ตับหวาน) – this dish is made in similar fashion to Nam Dtohk, but instead of barbecued pork neck, a semi-cooked liver is used. A dish, like a smell or a color can be so evocative in their place or time. This dish always flys me back to the food stalls of Chiang Mai with its vivid color and tartly savor. In this fast moving world, it is good sometime to pause for a moment, and to have a dish that emphasis relaxation, and allows you to enjoy a feast of textures and colors, because it is never eaten alone. It is served with a rich plate of accompanying vegetables pleasantly arranged, and with a group of good friends; all sharing the centrally placed bowl of the shiny red relish. I had no idea how much laap could vary. I’ll have to give it another shot! Great article, one of our favorite foods and frankly one we’ve often improvised with a heavy dose of herbs. Now, I’ll try some of the regional variants you’ve mentioned. Your article cleared up my misconceptions about the laap I ate in Chiang Mai, it had a heavy dose or organ meat and also lots of dried spices. Totally different from the laap we see in US. I am very impressed with your website. I am from southern Thailand and live in NC. I love good food and cooking. You provided very distinguish dishes from all over Thailand plus Lao. I have tried a fish dish and it was very interesting. I ‘d try more of your dishes. Thanks for posting them. Thank you so so much for such a great and through article on laap. Really appreciated the detailed information – not easy to find on the internet. I’m so greatful. You have a new follower. I have a favorite Thai restaurant that I frequent for lunch and dinner. They serve a dish that they call Ha Chai that is a mixture of mainly vegetables and a protein which can be chicken, beef, pork, sea food or tofu. It has green bell peppers, red bell peppers, spring onion and a a shredded vegetable that I cannot identify, plus Thai basil, Thai peppers and most importantly, immature, black peppercorns. In addition it has garlic, ginger or galangal. I’m wondering if there is a traditional recipe that includes these ingredients and if there is a sequence for cooking them that might replicate the flavors that I get with this dish? Hello Mike, the name does not ring a bell… please note that bell peppers are not traditionally used in Thai cooking, and also the ginger is a bit out of place. in Thailand they would probably use krachai (wild ginger) instead…. that said, what you describe resembles a stir fried recipe that is called (ผัดฉ่า) phat chaa. In which, garlic, chilies, wild ginger, fresh peppercorns and basil are stir fried mostly with seafood. Very interesting article on the different types of laap. I like some laap dishes, like duck or chicken laap, although I am not yet ready for laap leuat (blood). 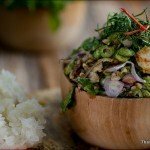 Do you have reliable sources to support your statement that laap originated from Yunan province, and that the word “laap” actually means in Lanna language “to mince or chop”? I always thought that laap was created by the Lao people during the Lan Xang kingdom (from 1350 to around 1800 AD) that comprised people from both the current country of Laos and the Esan region of Thailand. Laap has since always been a popular dish in Laos, Esan and Lanna. Until only recently (after the Vietnam war) that laap, as well as papaya salad, have become popular in the rest of Thailand, and can now be ordered in Thai restaurants primarily own by Lao or Esan people in the West. Again, great pieces of work. Dear Pat. There are numerous online references that support the point that the word laap is both a verb (to mice) and a noun (the dish). Professor Thanet Charoenmuang of Chiangmai University (Thai: ศาสตราจารย์ ดร.ธเนศวร์ เจริญเมือง) in his essay about ‘Laap Muang (ลาบเมือง)’ confirms it. Laap is popular among the Tai Yuan, Tai Lu and Shan people and can be found in areas outside the ancient LanXang kingdom. Dr. Charoenmuang follows the origin of laap along the spice route, and the Tai Lu population to the Sipsong Panna region. What a fantastic article, thank you! Know so much more about the Laap from the Lanna region now! Thanks for clearing up the names of various kinds of laap. I was not aware that Laap Muang was a general term–I cannot wait to return to this region and try more varieties of laap. I have only sampled Laap Khua Naam and Laap Niaaow. Both were incredible gastro-experiences, but I am slightly intimidated by the prospect of trying to recreate them here in the states. I feel like I need to learn more about these dishes firsthand before I can do them justice.